Public Opening at Epsten Gallery: Sunday, November 13, 1-4 p.m. The Epsten Gallery presents Yuval Yairi: Surveyor, a solo exhibition featuring 16 photographs by noted Israel-based artist, Yuval Yairi, on view Nov. 13, 2016 through Jan. 22, 2017. Yairi ‘s works come from his current Surveyor series and selections from Land, the precursor to Surveyor. Yairi was a visiting artist in Kansas City from Nov. 7 – 16, at the Epsten Gallery, located at Village Shalom, 5500 W. 123rd St., Overland Park, Kan. The final program of Yairi’s residency was held Monday evening, Nov. 14, 6:30 – 8:30 p.m. at the White Theatre of the Jewish Community Center of Greater Kansas City (The J), 5801 W. 115th St., Overland Park. Showing a short film and a video selection of photographs, Yairi will share remarks about his unique approach to artistic expression and his focus on the exploration of “place” in the context of memory. The presentation, followed by a light reception, is offered by the Epsten Gallery in partnership with Jewish @ The J Department of the Jewish Community Center. It is free and the public is invited to attend. Yairi’s work explores the subject of “place” in the context of memory – whether it’s a historical place, cultural, personal or political. Concurrent themes of time, identity, geographical location and war emerge within Yairi’s gridded photographic images depicting mountainous terrains, windowed interiors and landscapes that are expansive and starkly beautiful. 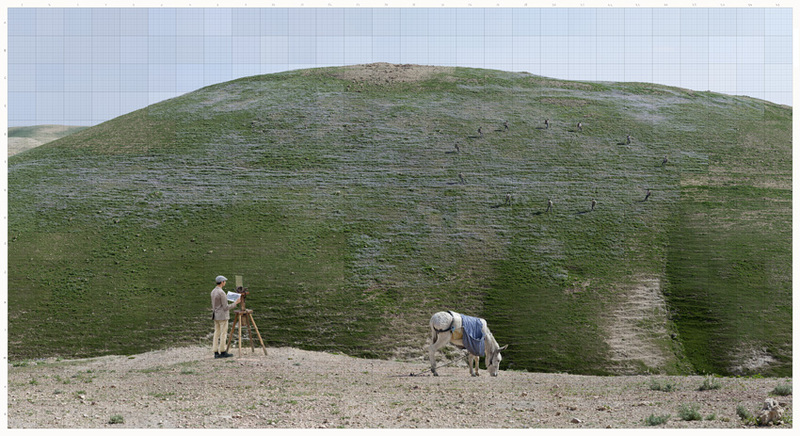 These gridded images are composed of hundreds of frames of a site captured by Yairi’s camera over an extended period. Yairi digitally deconstructs and recomposes them to invent a sort of “timeless” place, both detailed and distant. A lexicon of symbols, specific tools and codes within the images indicate and identify the Surveyor, Yairi’s alter ego. This theme merges into a series of studio still-life constructions and documentations of bullets, collected and archived by Yairi from the Israeli landscape. This body of work is largely informed by Yairi’s service as an Aerial Scout in the Israel Defense Forces (IDF), which introduced him to photography while also leaving a lasting, difficult impression on him. Specific references to his life, homeland and perspective are the foundation for Yairi’s work, yet the language and artistry of his images find a universal, compelling voice for audiences of all backgrounds and cultures. Born in Israeli, Yairi lives and works in Jerusalem. Prior to attending college, Yairi served in the Israel Defense Forces working at first in the armored corps as a tank driver followed by his service as an aerial scout. He remained in the reserves in the same unit until 2000. Yairi studied visual communication at the WIZO College Haifa before managing a design studio in Jerusalem for 11 years. Yairi produced and directed short films and documentaries until 2004. Since that time, Yairi has devoted his work to research and artistic activity, primarily in mediums of photography and video. Yairi’s work has been exhibited in museums, galleries and festivals in Israel and abroad including The Israel Museum, Jerusalem (2004); San Diego Natural History Museum, California (2007); Three Gorges Museum, Chongqing, China (2008), and the Tel Aviv Museum of Art, Israel (2011). His works are in permanent museum and private collections worldwide, including the Israel Museum, Tel Aviv Museum, Livnat in Holland, Naggar in England, Berman and Bloch in Los Angeles and Constantiner in New York.